Here’s a list of my books and where you can find them. 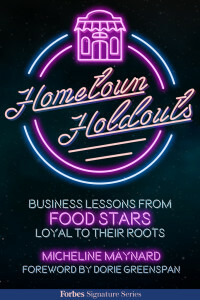 Hometown Holdouts: Business Lessons From Food Stars Loyal To Their Roots (2016) tells the stories of chefs, food companies, and food producers who are nationally famous, but who’ve chosen to stay in one place. You can order the FORBES eBook from Amazon and iTunes. Curbing Cars: America’s Independence From The Auto Industry (2014) looks at changing attitudes about driving. It explores the roots of Uber, Lyft, Zipcar, bikesharing and all manner of alternatives to cars. It is the top-selling eBook published by Forbes. Find it on Amazon. The Selling Of The American Economy (Crown Business, 2009) looked at foreign companies’ presence in the United States, and their impact on local communities and employees. Find it on Amazon in hardcover, Audible and Kindle editions. The End of Detroit: How The Big Three Lost Their Grip On The American Car Market (Doubleday, 2003) predicted the decline of Detroit’s automakers and the rise of Toyota and other global companies. Find it on Amazon in hardcover, paperback and Kindle editions. The Global Manufacturing Vanguard (John Wiley, 1998) explored the similarities between the world’s most successful manufacturing companies. Find it on Amazon. Collision Course: Inside The Battle For General Motors (Birch Lane Press, 1995) told how GM almost went bankrupt in 1992, nearly 17 years before the restructuring led by the Obama administration. It’s a vital read to understand how GM hit bottom and climbed back. Available on Amazon.